A Guest Column today from Chris Black of Number Thirteen Press. Number Thirteen Press – The End? So that’s it, then. Thirteen crime novellas from thirteen authors in thirteen months. Richard Godwin’s Ersatz World was the last, and Number Thirteen Press is finished. Only, not quite. Of course there’s still the admin and the accounting and the marketing. The boring bits I’m not very good at anyway. But the publishing part is finished and it’s been one hell of a ride. Didn’t quite manage thirteen consecutive months, which I knew was an ambitious target, but had a damn good go and it’s been seat-of-the-pants stuff all along – a seemingly endless chain of literary panic. And it was fun. Lots of fun, and I got to work with thirteen fantastic authors (who were dragged deep into the panic and all responded brilliantly) and publish thirteen books that I genuinely believe in. At the start I had to choose the limits I would set in the submissions guide, and I decided to leave it as open as possible. The result was books of real variety, showcasing genuine talent across a spectrum of crime fiction that is broader than I could have imagined. Would I do anything different, starting again? Of course I would. I went in with some design experience and some editing experience and made everything else up on the spot, so of course I made mistakes and had to work even harder as a result. Some things could have been better. But I don’t regret any of it, either. If I was starting now it would be easier for the experience, but if I waited for experience I would never have started. I jumped in to see if I could swim. Well, I ain’t drowned yet. And that’s bring us to the real poser, the question that seemingly everyone wants the answer to: what next for Number Thirteen? Is there more? If I knew, I’d tell you. First things first, and first I’m taking a break. My own writing has taken a back seat for too long. But in the future? The publishing took up far more of my time than I could have guessed, so it’s hard to promise that sort of commitment. It certainly doesn’t pay well. A friend in the business once told me that small press publishing is about the 1 in 10: the one success that allows you to publish the other nine, and so far he’s been proved just about right (although we are batting above average). And anyway, there are more publishers filling that hole. I really believe in novellas and short novels (under 60k words) as the perfect crime/hardboiled/noir length: think They Shoot Horses Don’t They? and James M Cain. In fact, The Postman Always Rings Twice probably wouldn’t be published today, too short. When I first had the idea, there were crime short stories and flash fiction online, and crime novels that I often found 10 or 20,000 words too long, but only a couple of small presses who would consider that in between length – the novella to short novel, perfect for the contemporary ebook equivalent of the old paperback originals and an era when publishing had more ideals than business sense. Enough space to really develop the story, but shorter than demanded by the economics of legacy publishing. Short, sharp and tight, with depth but no wasted words and no padding. A lot of people really bought into the project: initial readers, reviewers, the thirteen authors, of course; but also others who weren’t connected, simply because they loved the books, the format, and the idea. But now more and more small presses are stepping in to the gap. Does the world need another Thirteen? But at the moment I just don’t know. A break, finish a novel or two, catch up on my own reading and viewing. And in the future, another set of 13? Or a different publishing model? Or with a partner? Or…? I guess in six months or so we’ll see how much I miss the buzz of putting out some of the most original, intriguing, exciting and just damn brilliant crime fiction around. For the moment, excuse me while I sit back, look over those covers, re-read a few favourite chapters and enjoy what is, before I decide on what might be. And when I’ve rested up, I might just do it all over again. Put me down for definitely, maybe. 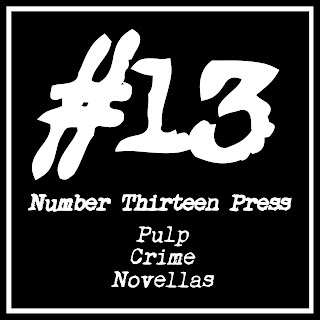 NUMBER THIRTEEN PRESS IS HERE.